Poison hemlock (Conium maculatum) is one of the most lethal plants found in North America. This biennial weed is now in full flower throughout much of Ohio. So, the clock is ticking on preventing seed production by this non-native invasive plant. As a biennial weed, poison hemlock spends the first year as a basal rosette and the second year as an erect, towering flowering plant that can measure 6-10' tall. I stand around 6' 2" and as you can see in the photo below, I cannot reach the top of this poison hemlock plant. Poison hemlock belongs to the carrot family, Apiaceae (formerly Umbelliferae). It shares many characteristics with other notable non-native members of the carrot family found growing in Ohio such as Queen Anne's Lace (Daucus carota) and Wild Parsnip (Pastinaca sativa). 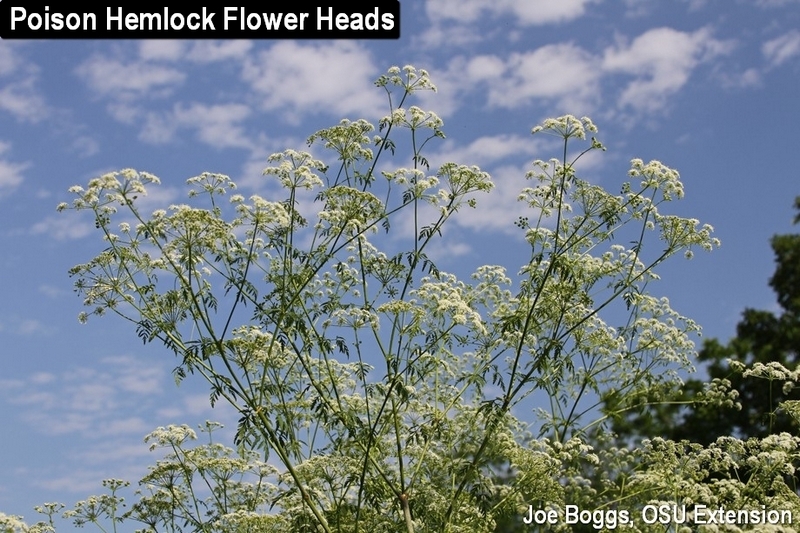 Indeed, some of the accidental poisonings in the U.S. have occurred with people mistaking poison hemlock for Queen Anne's Lace. Poison hemlock contains highly toxic piperidine alkaloid compounds, including coniine and gamma-coniceine, which cause respiratory failure and death when ingested by mammals. The roots are more toxic than the leaves and stems; however, all parts of the plant including the seeds should be considered dangerous. It is a common misconception that poison hemlock sap will cause skin rashes and blisters. In fact, poison hemlock toxins must be ingested or enter through the eyes, cuts, or other openings to cause poisoning. All stages of the poison hemlock plant have bluish-green leaves that are 3-4 times pinnately compound, and the deeply cut parsley-like leaflets have sharp points. Flowering plants have hairless, light-green to bluish-green stems that are covered with obvious purplish blotches. Clusters of tiny white flowers are borne on structures called umbels that look like upside-down umbrellas. While poison hemlock can be partially managed by mowing and tilling, the most effective control approach involves properly timed applications of selective or non-selective post-emergent herbicides including glyphosate (e.g. Roundup). However, applications of herbicides must be made now to have any chance of reducing seed production this year.